This post is sponsored by Kellogg’s®. All comments and opinions are my own. 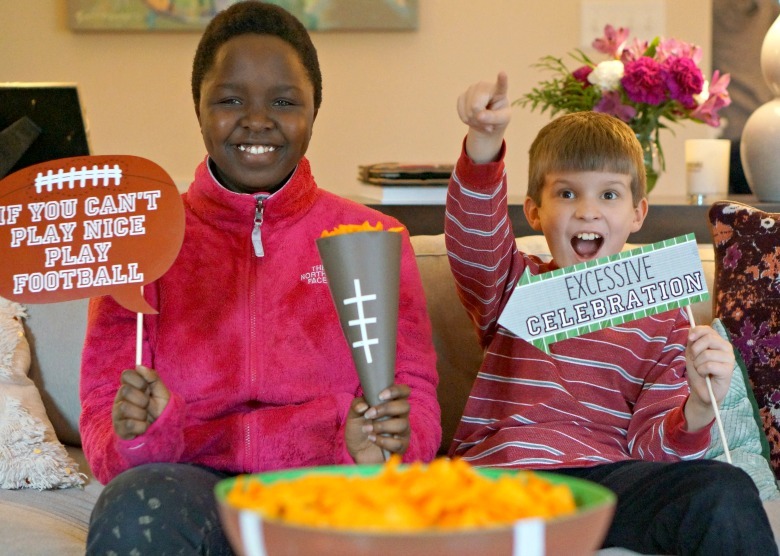 Raise your hand if you wish that the big game was a national holiday! Or at the very least, the Monday afterwards should be. Right? There’s no way we’re getting the kids to bed on time when there’s a big football game on. And the day after? We’re ALL zombies. It’s worth it though, to have friends and family pile up in the living room to cheer on our favorite teams. 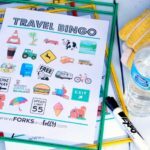 With adults and kids welcome, it’s a casual affair. 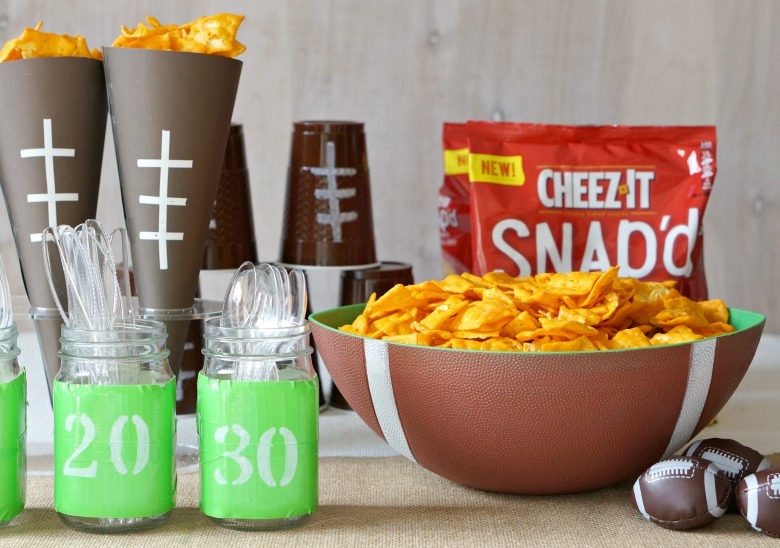 We’ll order pizza, serve some salty snacks like the new Cheez-It® Snap’d™ Double Cheese snacks, and for that little something ‘extra,’ I have a few simple DIY football party décor ideas. 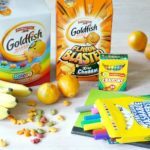 My family DIGS the new Cheez-It Snap’d Double Cheese snacks, a super thin and crispy snack made with real cheese inside and out for BIG cheese flavor. 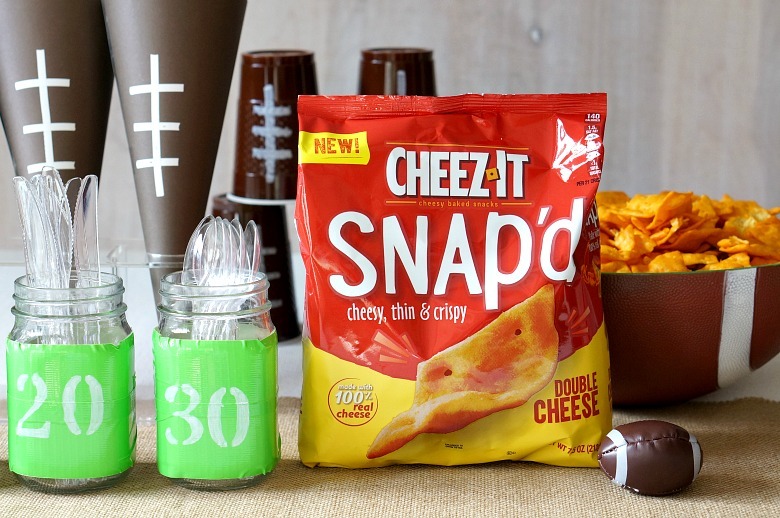 Cheez-It Snap’d Double Cheese snacks TURN UP THE CHEESE VOLUME on the other snacks with 100% real cheese baked in AND sprinkled on top for that cheesy goodness we all crave while watching the big game. It really is that simple – schedule your pizza order in advance so you don’t have to worry about it once your guests arrive. Set out some large bowls for snacks. 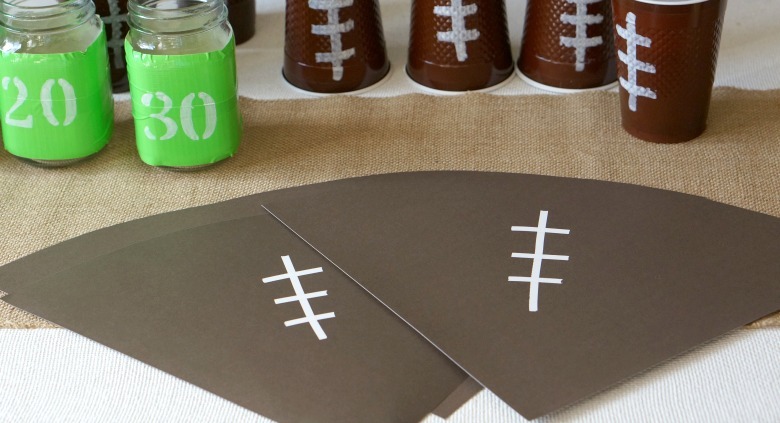 And, if you’re inspired, whip up a few of these simple easy DIY Football Party crafts. 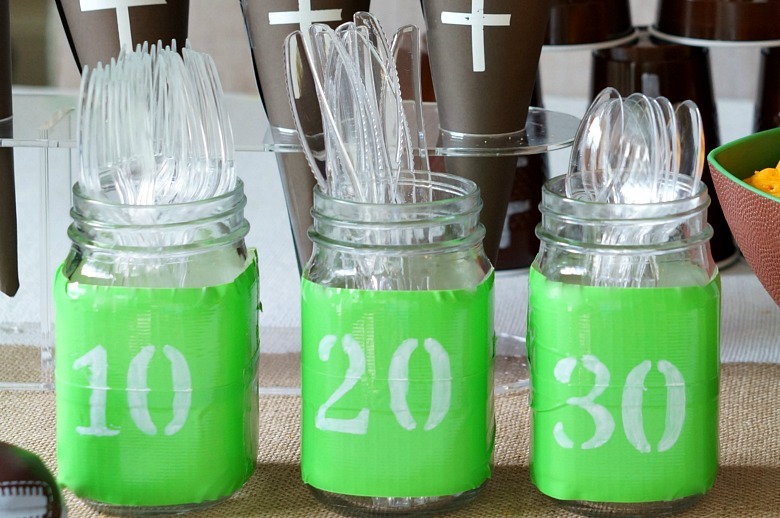 If like me, you hoard mason jars, then this will be one of the easiest crafts to execute! 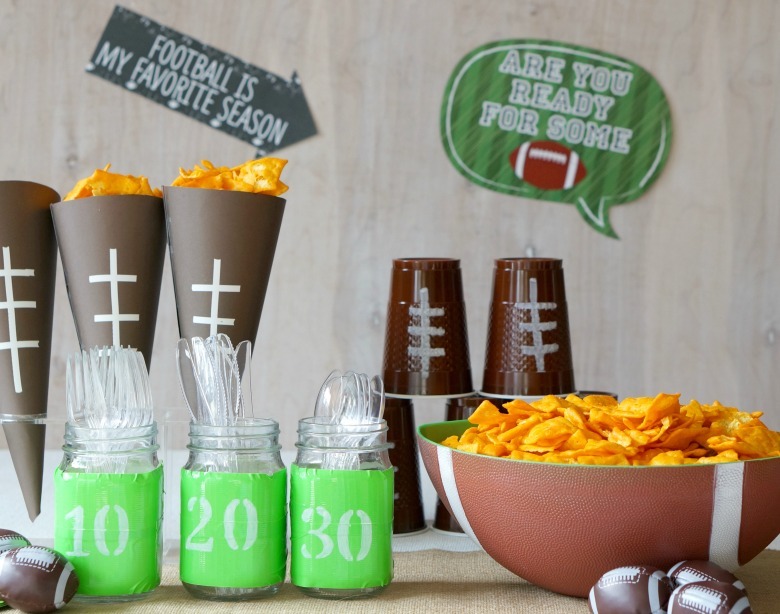 All you need to make these football field utensil holders are a few mason jars, green duct tape, numbered stencils and a white paint pen. 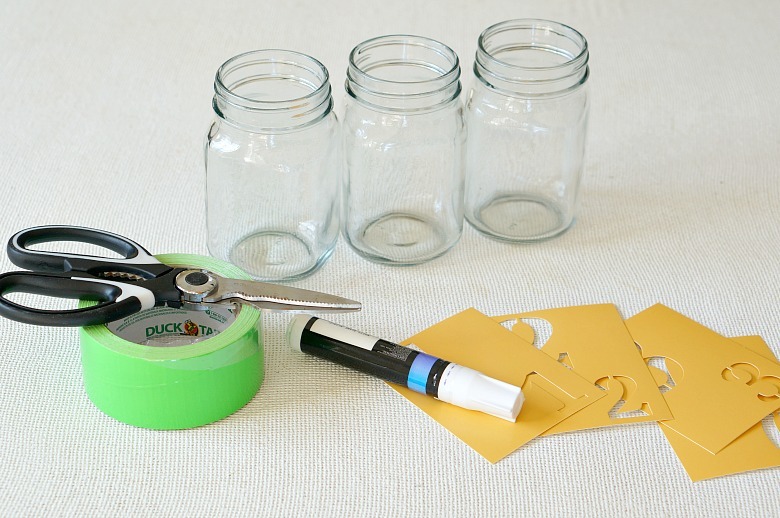 Start by wrapping each mason jar with green duct tape. 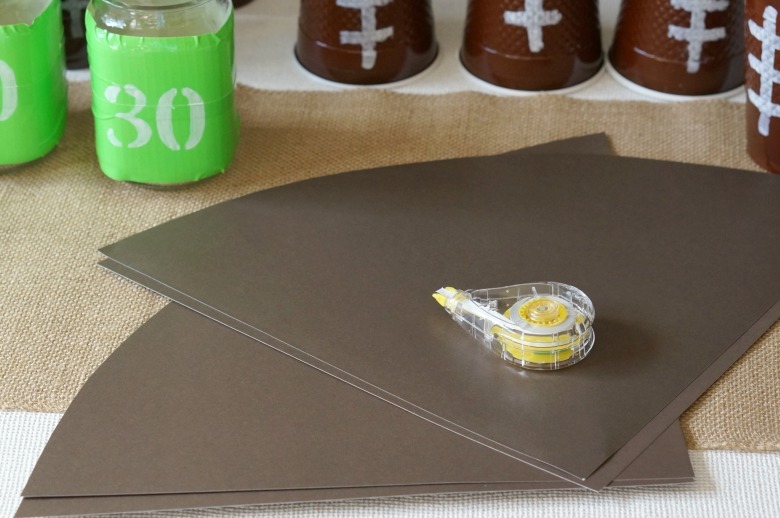 Next, place the stencils over the tape and carefully fill them in with the paint pen. Allow the numbers to dry completely before using. 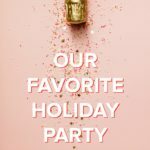 You can either remove the duct tape after using them for your party, or keep them for next year! They’re so cute! This one doesn’t need a tutorial because it’s so simple! 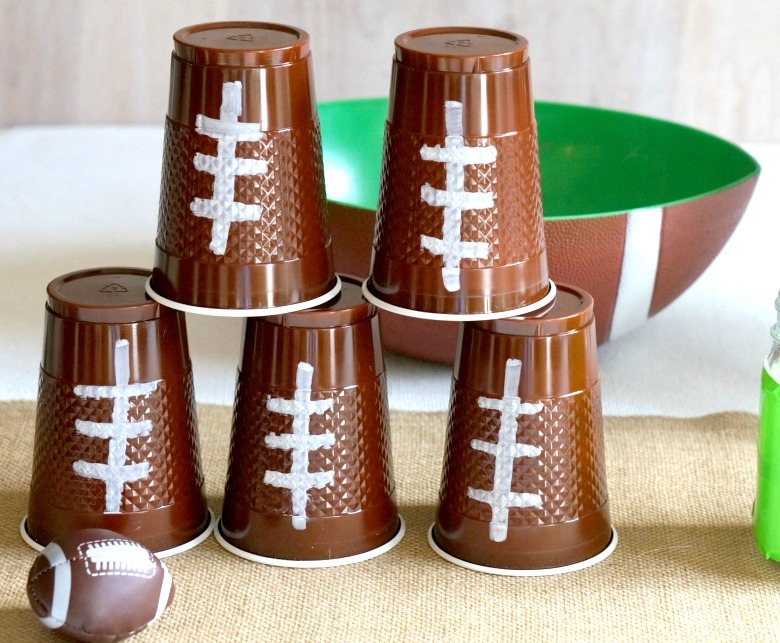 I ordered some brown plastic cups and used my handy paint pen to fill in the football stitches. The kids love helping me with this project. 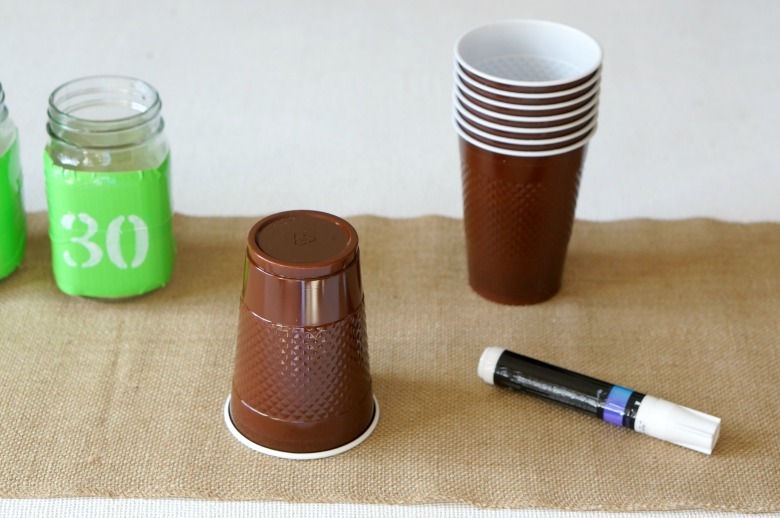 Keep the pen out during the party so guests can write their name on their cups, too. 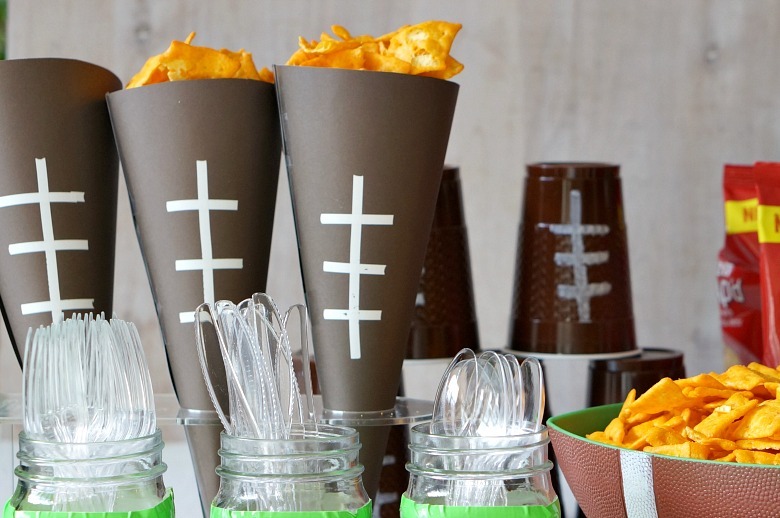 These football-themed snack cones are my kids favorite way to enjoy Cheez-It Snap’d Double Cheese snacks. Start by cutting an arc from corner to corner on a large piece of square cardstock. Scrapbook cardstock works great for this project. Next use a white out pen to create the football stitching, then wrap the cones and seal with tape. 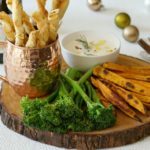 Fill them up with your favorite snacks, and if you have one, use an ice cream cone server as a way to keep them upright! Have you tried Cheez-It Snap’d Double Cheese snacks yet? If not, you’re missing out on the real cheese snack with a BIG flavor and a thin and crispy SNAP! Find Cheez-It Snap’d Double Cheese snacks in the snack aisle at your local Publix. Be sure to click here for big savings from 1/19/19 – 2/1/19 where you can save on new, Cheez-It Snap’d Double Cheese snacks at your local Publix!